Drawing of University Hall by D.C. Salisbury showing the view from the bottom, south side of the hill on the University of Wisconsin campus. Bascom Hall, built in 1859, was originally called University Hall. 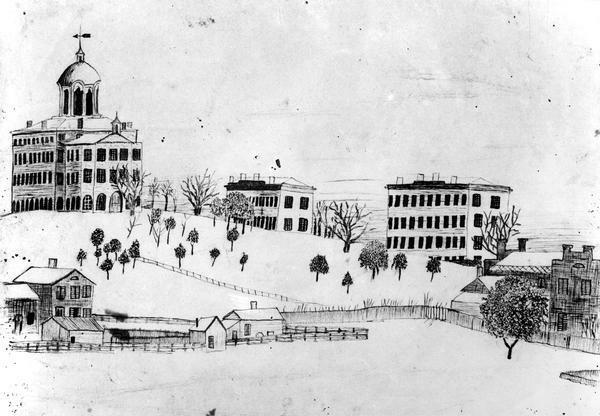 This sketch shows North Hall, built in 1851, the first building atop of College Hill; Old Science Hall built in 1877; and probably Chemical Engineering building, built in 1885. Bascom Hill was originally called College Hill. Related papers are held in the manuscripts collection of the Wisconsin Historical Society. See also the book titled: Pages from the Diaries of D.C. Salisbury.